Chicago has not stopped being what it has always been: a city dominated by violence and where even the ghost of Al Capone transits through its streets. Al Capone ruled Chicago. At gunpoint, his reputation was made. When he arrived to the Windy City, the US government was about to approve the 18th amendment to the Constitution, according to which the famous Prohibition Law came into force. The new prohibition catalyzed the birth of organized crime. Even if Al's world disappeared, the consequences of violence reach our days. After several years being the most violent city in the United States, Chicago currently records falling violence rates for 13 consecutive months. In Chicago, the struggle for power and control of the illegal traffic of alcohol provoked the confrontation between the mob "families". Today, the cartels and drug dealers are the ones that share the city out. The confrontations between them, at times, pale the years of Al -who came to earn 60 million dollars a year- but as then, the brutality of the crimes has forced the intervention of the government. In 2016, according to government figures, there were 771 homicides, while in the following year about 650. According to the records up to the first quarter of this year there were 108 homicides, while last year during the same period there were 140, which represents a 22% reduction. As it happened with Eliot Ness and his team of “untouchables ones” -at the time- the Chicago police has waged a war against crime. However, they know that it’s a long-term race, and that it will take time to continue reducing murder rates. According to Eddie Johnson, Police Superintendent, progress is being made but still cannot celebrate. Donald Trump considers street violence in that city is an epidemic that strikes its citizens. However, Eddie Johnson is hopeful that the Chicago security forces will continue to reduce these rates. According to the superintendent last month there was a 17% fewer of shootings, while homicides registered a 25% less. The positive reduction of violence indicators is possible due to the recruitment of more agents, a greater investment in technologies such as systems that detect the origin of the shots and computer programs that help to predict criminal acts and to direct the police reaction. However, gang-related shootings continue, whose figures are around 422, although last year they were a total of 565. Another beneficial step has been the recovery of illegal weapons in possession of several city gangs. In the first quarter 1,900 short and long guns were recovered. In 2016, 8,300 illegal fire guns were seized. Despite the work of the Chicago police, law enforcement officials are still concerned about the continued attacks to their members. On the superintendent’s point of view, criminals have lost their fear of the criminal justice system. An interesting fact, among the claims of Eddie Johnson is that there are no laws to prohibit carrying guns. In lines with that, Mayor Rahm Emanuel said that presidential aid will be no effective unless significant laws on firearms are passed. 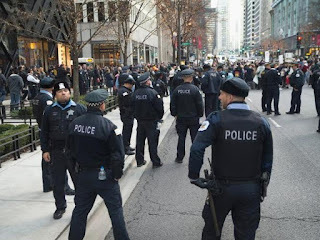 Chicago not only continues to be Al Capone’s city and the “Windy City”, but also the land of police officers like Elliot Ness and his team that presently confront the new capos in any corner. Can they reduce the stratospheric rate of 4,331 shooting victims and 762 murders in 2016? Time will tell.